A solar wind stream flowing from the indicated coronal hole should hit Earth on Jan. 2nd. Credit: GOES-13 Solar X-ray Imager. IT'S BACK: Sunspot 930, which unleashed four X-flares and sparked intense auroras in mid-December, is back. It is emerging over the sun's eastern limb following a two-week transit around the far side of the sun. Since we last saw it, the spot has probably decayed and now poses little threat for strong solar flares. Stay tuned for confirmation. 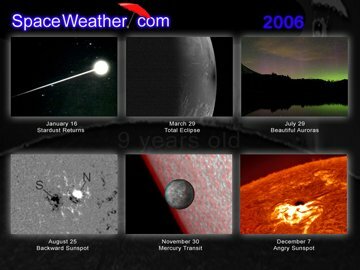 HAPPY NEW YEAR: 2006 was a good year for space weather: bright auroras, backward sunspots, powerful flares. Click on the image below to browse some of the highlights. Image credit: Greg Piepol of Rockville, Maryland. Next year should be even better. 2006 was a year of solar minimum, a low point at the end of Solar Cycle 23. 2007 should bring the first stirrings of Solar Cycle 24, predicted to be one of the biggest in history. There's a lot to look forward to.... Happy New Year! DARK CLOUDS: Four hundred years ago, astronomers thought sunspots might be dark clouds in the sun's atmosphere. Galileo proved otherwise. By tracking the motions of sunspots, he showed that they were not clouds but islands (of magnetism) on the sun's surface. Case closed. Photo details: SolarMax40, 76mm TeleVue, f/6.3. It's called a filament--a hundred-thousand-mile long cloud of hydrogen held above the sun's surface by magnetic force fields. Filaments existed 400 years ago, but Galileo couldn't see them because he didn't have a filter tuned to the deep-red glow of solar hydrogen. This filament is moving toward the sun's western horizon, where it will vanish a few days from now. If you have a solar telescope, take a look before it goes. You might see something Galileo never did.